Aiseesoft Free MXF Converter for Mac 6.3.36 無料ダウンロード - Convert MXF recordings to AVI, MP4, MOV, WMV video and MP3 audio formats on Mac. 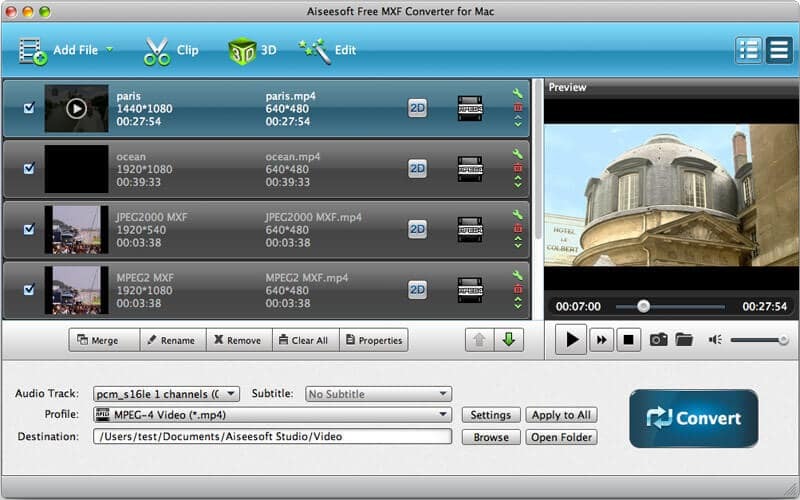 Aiseesoft Free MXF Converter for Mac is an easy-to-use Mac MXF Converter software, which can help users convert MXF recordings shoot by Canon XF camcorder, Panasonic P2, and other camcorders to AVI, MP4, MOV, WMV, HD AVI, HD MP4, HD MOV, HD WMV video and MP3 audio formats on Mac. So users can edit MXF videos in professional video editing softwares, such as iMovie, Final Cut Pro, Final Cut Express, Sony Vegas, Adobe Premiere, Avid Media Composer. Be able to convert recorded MXF video to MP4, AVI, MOV, WMV for editing in iMovie, FCP, FCE, etc. and enjoying in iPad, iPhone, PSP, smart phone, and so on. Merge different MXF sources together and output a single target video file for better enjoyment. To further edit the output profile, users can adjust the output video/audio resolution, bitrate, frame rate, encoder and, channels, sample rate, etc. Make the most of multi-core CPU to increase the speed. With the user-friendly interface, this software is quite easy to use.